The aim of this project is to identify opportunities and strategies to improve mango processing for selected markets through a better understanding of knowledge and stakeholder gaps. Fruit processing has a number of important roles, from meeting consumer demand for a wide variety of innovative products, to creating added economic value in fresh fruit markets and reducing waste. Mango is a particularly good candidate for processing since its characteristic flavour notes withstand the essential steps taken during preservation. As part of the ACIAR project, Australian Mangoes was invited to participate in a 2-day workshop in Denpasar along with key sector informants from the Asia-Pacific region (Vietnam, Philippines, Pakistan, China and Indonesia). Current processing technologies, manufacturing trends and consumer demands were among the topics discussed. Participants were also asked to contribute to identify the main challenges affecting mango processing development as well as the opportunities for the processing sector. This workshop was organised by Griffith University and facilitated by Professor Richard Beyer. Its findings will inform future research priorities. A second workshop will be held in Australia 20th Feb-21st Feb 2019 (location to be confirmed) and will bring together key Australian stakeholders from the processing sector to discuss and identify the challenges and opportunities to develop the mango processing industry in Australia. 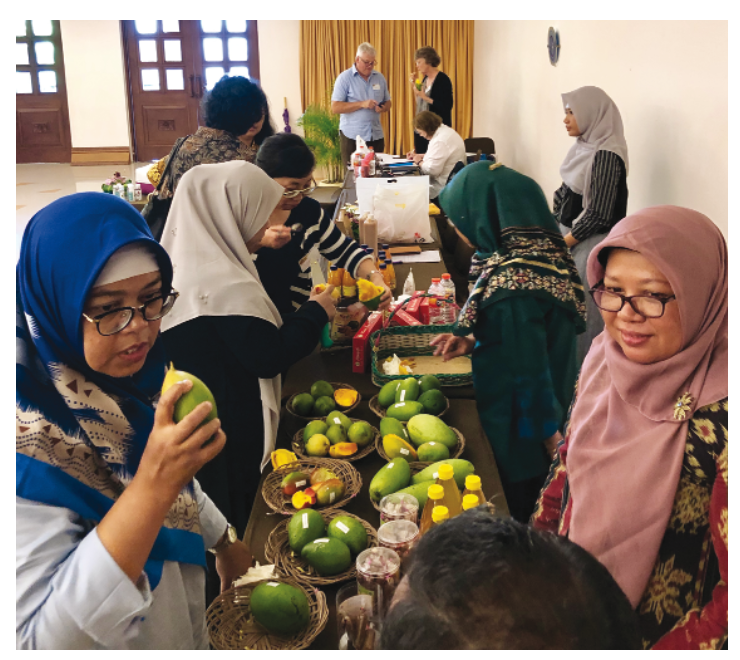 Stakeholders from the tropical fruit processing sector in the Asia-Pacific region met in Denpasar to identify opportunities to improve mango processing. Pickled mangoes with chilli salt. Workshop attendees sampling different mango varieties and products. Australian Mangoes is currently participating in a small research activity (SRA) funded by the Australian Centre for International Agricultural Research (ACIAR). The SRA is focused on opportunities and strategies to improve biosecurity, market access and trade for selected mango markets. This agribusiness program led by Griffith University has significant contribution and country-level coordination from each of the six ACIAR partner countries, Cambodia, Indonesia, Pakistan, the Philippines, Vietnam, and Fiji. This project includes support from leading mango technical institutes in Australia, such as the Northern Territory Department of Primary Industries (NTDPI) and the Queensland Government Department of Agriculture and Fisheries (QDAF). China represents an important export and potential export market for all of the ACIAR partner countries with its emerging middle class and relatively low consumption base. Australian Mangoes component of the SRA is to capture the current difficulties and challenges Australian exporters face when exporting to the Asian countries, namely China. This activity has included meeting with key Chinese importers and a range of supermarkets throughout China to gain a better understanding of what the issues and challenges importers and retailers face with imported mangoes to China. Understanding how to tell when it’s ripe and ready to eat was a key barrier to purchase. We asked the case study groups what they think of mangoes, in particular Australian mangoes. Across the board mangoes are seen as a premium produce line and Australian mangoes are seen as the premium of the world’s mangoes. It was emphasised at a number of retailer operations that Peruvian mangoes had improved their quality of offer to the Chinese market – definitely a competitor closing the gap. Australian mangoes are highly sort and usually given as an ‘individual boxed gift’ at Chinese New Year and can sell for as much as $20 AUD per mango. Different biosecurity requirements for domestic and foreign markets make it increasingly complex for growers to service multiple markets. Australian Mangoes have been working and will continue to engage with Australian exporters to capture the challenges as we progress throughout this season. Older PostMango Mania hits Bondi as Mess-tival celebrates its 7th birthday!